There is a small Japanese curry stand located on the basement level of the UBC II Building at the mouth of Soi Sukhumvit 33. Outdoors, directly across from the entrance to the Londoner Pub, the J Curry shop is impossible to see when you pass by on the street level. Nonetheless, its excellent homemade curry is worth seeking out. Made from ground spices, apples, and other fresh ingredients, the curry is tangy and sweet and loaded with antioxidants and vitamins. 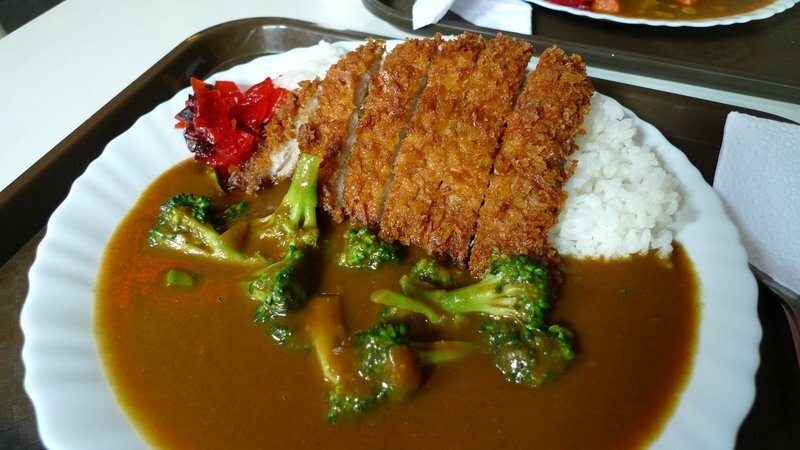 Combined with your favorite vegetables, some protein (I love their breaded lean pork cutlet, or katsu), a scoop of Japanese rice, and a small portion of pickles, the curry makes for a healthy and satisfying lunch. How they manage to stay in business with such lack of visibility is a mystery, but I’m glad they do! This entry was posted in Uncategorized and tagged Bangkok, curry, Dining, food, Japanese, JCurry, katsu, Krungthep by christao408. Bookmark the permalink. Mmmm… I could use more rice to go with all that sauce. For a moment, I thought you wrote an entry about Gary. @ElusiveWords – Ha ha! There’s actually a bit more rice than it looks like. @slmret – Yep, basically the same thing. You can see the Japanese influence in the islands! @christao408 – Oh, yes — definitely Japanese influence in the islands. Japanese curry (which was actually a British importation to Japan) is one of my faves. I came to like making my own sauce from ingredients rather than buying the ready-made powder. I never really converged on a typical blend, but that’s kind of because you can vary it infinitely and not ruin it. (I wrote about it before, but now I see that entry has some X-rated content in it as well.) Thai curries are another matter, I don’t think I would dream of trying to make those from scratch. @n_e_i_l – How do you make Japanese curry from scratch? Any recipe you would recommend? I’ve only used the cubes, which I realize is cheating. I am not a big rice eater with main courses. I tend to avoid it as it fills me too quickly. That is not to say that soaking it in curry doesn’t tempt me to eat more . I’m planning on making a Japanese curry this next week! (yes I’m a cheater too) Today is an Indian yellow curry dish. I am hoping to make the 3rd week into a Thai curry week… I do like my curry! Yum – curry with rice…. Whoever invented curry was a genius. There is beef broth gravy, Turkey gravy and pork curry. Yes they probably have a pork broth gravy and have other added flavors.Top dishes with rice: Chicken and rice is probably the number one rice combo. Beef with rice is number two and Pork with rice is probably number three.Meanwhile I soon will have dinner with sausage meat with rice and lentil combo. Looks and sounds like something I would love. @christao408 – Oh, what the heck—here’s that earlier entry. I don’t think I ever did a followup with more details, but basically Japanese curry sauce is just a roux plus curry powder, which is a made-up construct to begin with—which means there’s really no such thing as cheating. And to say “from scratch” was a bit misleading of me, I just meant “with a blend of spices of my choosing,” generally some combination of ginger, cinammon/cloves, allspice, cardamom, mustard, cayenne pepper, turmeric, and/or coriander, which I usually had some subset of on hand. It’s even easier if you use catsup as a base, because then you don’t really have to thicken it further (or I prefer not to, anyway). I just do the thing where you quickly sauté the spices in hot oil and sweat the vegetables a bit, then add the catsup and enough water so as to leave a gravy of whatever thickness you want when the vegetables (and meat if you have it) are done cooking slowly, covered. I suppose if I were to be “honest” about it, I’d be making my own catsup and grinding bulk spices in a mill. My grandma made a good Jap curry and we get to it this if we were visiting her place, of course. Not only the curry sauce is good, but the way she prepared the meat is crispy at the same time. Is that meat up there made crispy as well? *smile*Love it! Yummy! katsu curry! i’m so sad, i didn’t get to eat this when i went back to hawaii; i don’t know anywhere around here that sells that. TD and I both love Japanese curry and there is an wonderful spot in the city called Ocean Palace we used to always stop at just for the curry. I feel like such a virgin, now! I’ve only made Indian currys. Now I shall have to venture over to Neil’s site and figure out how to make this Japanese curry. @Kellsbella – http://www.thefoodpornographer.com/2010/05/02/dinner-japanese-curry-with-chicken-and-vegetables/ See if you can find this stuff. My ex-mother in law used it when she made curry. Good stuff, comes in different heat levels.